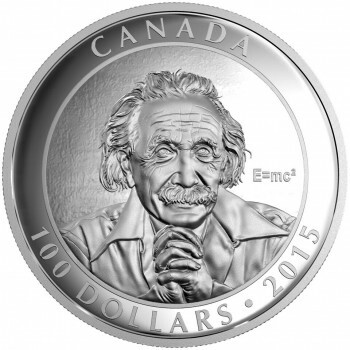 The Royal Canadian Mint has launched a new coin paying tribute to both the centennial anniversary of one of the most important elements of scientific theory and Canadian photographer Yousuf Karsh (1908-2002), renowned the world over for some of the most poignant portraits of the 20th century. Karsh was born in Armenia but left as a child when his family was forced to flee the persecution and war then ravaging their homeland. They fled on foot, taking no baggage. During their month-long journey with a Bedouin and Kurdish caravan, Karsh remembers his parents losing every valuable they had managed to save. His father’s last silver coin went to rescue the young Karsh after he was caught making a sketch of piled-up human bones and skulls, the last bitter memories he had of his country. From the safety of Aleppo, Syria, the family tried to rebuild their lives. Despite continual struggle, Karsh’s father found the means to send him to his Uncle Nakash in Quebec, Canada. Nakash was a photographer of established reputation, and a man of generous heart. The seventeen-year-old Armenian boy spoke no English and little French, yet he settled in well to the local school, making friends and otherwise receiving a warm reception. In 1926, Karsh apprenticed for his Uncle and the art of photography took hold of his interest and energy. With a camera given to him from his uncle, Karsh gained his first success by photographing a landscape with children playing, which he gave to a classmate as a Christmas gift. Secretly he entered it in a contest and, to his amazement, it won him first prize and the princely sum of 50 dollars. Karsh gave ten dollars to his friend and happily sent the rest to his parents in Aleppo, the first money he could send to them. Shortly afterward, his uncle arranged an apprenticeship with his friend John H. Garo of Boston, a fellow Armenian, who was recognized as the outstanding portraitist in the eastern states. This apprenticeship eventually lasted three years and was to have a great impact on Karsh in terms of developing his own distinctive interpretations of his subjects and settings. Returning the Canada, Karsh managed to set up his own studio, which found minimal success until the moment of his big break. One of the leading actors at that time in Canada was Lord Duncannon, the handsome twenty-one-year-old son of then Governor General, Lord Bessborough. Lord Duncannon prevailed upon his parents to sit for the keen photographer and soon the Governor General, in full regalia with sword and decorations, accompanied by his elegantly gowned, statuesque French wife, visited Karsh’s studio. Although the first session did not go well, his VIP subjects proved understanding, and consented to sit again for the nervous young photographer. This time the portraits were a great success. They appeared in the Illustrated London News, the Tatler, the Sketch, and other newspapers across Canada. From then on, Karsh’s career took a meteoric rise and he never looked back. Karsh went on to photograph world figures such as Franklin Roosevelt, MacKenzie King, and Winston Churchill. One of Karsh’s more celebrated photographs took place in 1948, when he was given an opportunity to capture a very distinct image of eminent physicist Albert Einstein. In 1905, Dr. Einstein determined that the laws of physics are the same for all non-accelerating observers, and that the speed of light in a vacuum was independent of the motion of all observers. This was the theory of special relativity. It introduced a new framework for all of physics and proposed new concepts of space and time. Einstein then spent 10 years trying to include acceleration in the theory and published his groundbreaking theory of general relativity in 1915. In it, he determined that massive objects cause a distortion in space-time, which is felt as gravity. As a result of these principles, Einstein deduced that there is no fixed frame of reference in the universe. Everything is moving relative to everything else—hence, a theory of relativity! Karsh took a number of photographs during his session with Einstein at Princeton’s Institute for Advanced Study in 1948, two of which became iconic images of the Nobel laureate. The coin’s reverse includes a reproduction of one of those portraits, expertly reproduced by Royal Canadian Mint engravers. As a unique addition, Einstein’s breakthrough formula, E=mc2, has been included within the design, positioned just to the right of Einstein. 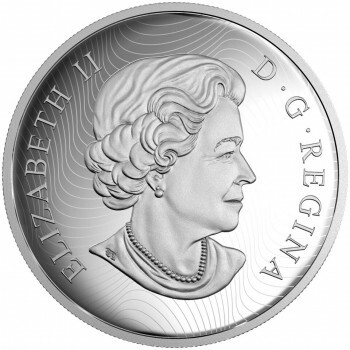 The obverse features the familiar effigy of Queen Elizabeth II designed by Canadian artist Susanna Blunt and used on most Canadian coinage since 2003. 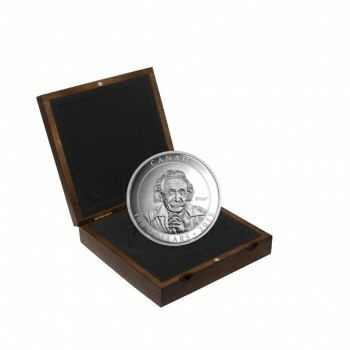 The large 10-ounce silver coin is encapsulated and presented in a Royal Canadian Mint-branded maple wood presentation case, with a graphic outer protective box. This coin is the first in a new series by the Royal Canadian Mint featuring iconic portraits of the 20th century taken by Yousef Karsh. For more information on this and other coins offered by the Royal Canadian Mint, please visit their Web site. Information is offered in English and French, with international orders dispatched where applicable.